Is there any way to make this a first class citizen? Alternatively, it would be great if we could get documentation around the Mode visualizations, and synthesize metastatements to define these visualizations. I want to do something very similar to this. 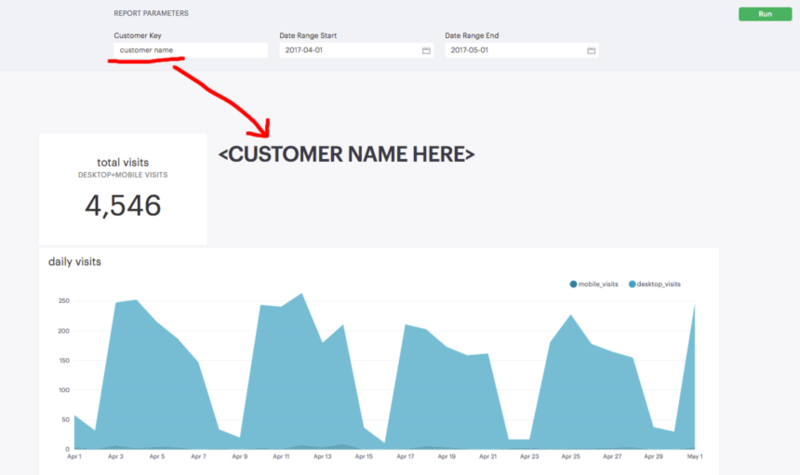 I have a report where I use a single parameters to filter a report by Customer and date range. I want to display the Customer's name (which is in the database as a string) in "Big Number" style at the top of the report. I will try to use the technique from Donna McGahan 's example to work for my case, but it would be great to be able to do this natively too. Thanks Donna! Greg Phelps did you ever figure out a solution for your problem here? And was this an external or internal report? Curious how you're handling parameters if you're sending these reports outside your org. I am bumping up this request to have Big Text too in addition to Big Number. Thanks for the feedback Adam Stone . I've gone ahead and added this feature request, and will keep you informed if our team decides to move forward with it! While Mode's devs continue to take ages to natively add some basic chart/visualization features that people have been asking for years, and have existed on other platforms (e.g., Chartio) for years as well, I figured out how to add a "Big Text" style chart without too much trouble using an R Notebook. First, write R code such that the value you want in the Big Text is assigned to a variable, say, "bigtext"
Then the following code will produce a ggplot that just shows the text and nothing else (the plot and axes are hidden, etc.). You can click the "Add to Report Builder" icon for that code block and the big text will be added to the report.